In an absolutely horrendous technical blunder, hundreds of millions of dollars worth of Ethereum were frozen yesterday after an ordinary user accidentally exploited a vulnerability in popular Ether wallet, Parity. The glitch has left thousands of users using multisignature wallets created after July 20 locked out of their accounts – and without any viable way to move their funds to alternative wallets. According to researchers, the total amount of frozen funds is between $150 and $280 million. In the aftermath of the glitch, numerous flustered Ethereum enthusiasts rushed to Twitter and Reddit seeking answers from Parity Technologies – the company behind the affected wallet – as well as the rest of community’s leaders. But it seems they’re not getting the answers they were hoping for. While the crypto community remains split over Vitalik’s refusal to engage in the discussion, many were quick to point out that the Ethereum Foundation has no obligation to intervene into complications triggered by third-party companies with no direct ties to the Foundation. Meanwhile, Parity has confirmed the issue on its blog and official Twitter account, informing users its developers are currently looking into the situation and will report back once they know more. Unfortunately, it has been more than 20 hours since their last update. What is more troubling though is that it seems there are no easy workarounds to get affected wallets up and running again. In fact, the only solution appears to be a hard fork in the blockchain, according to Ethereum developer Nick Johnson. Not everyone seems convinced hard-forking will be the right decision for the Ethereum community in the long run though. In the meantime, a growing portion of users appear to be warming to Ethereum Improvement Proposal 156 – a proposed emergency protocol for recovering locked-up Ether written by none other than Buterin himself. Still, the proposal would need to undergo minor changes before it can be implemented accordingly. The more troubling part – at least from the standpoint of Ether users and the Foundation – is that hard-forking as a means to fixing a technical issue could compromise the immutability of the Ethereum platform. For many blockchain enthusiasts, it is precisely the immutability aspect that makes Ethereum a fan-favorite. Historically, this wouldn’t be the first time the Ethereum Foundation has resorted to hard-forking to fix massive blunders on its platform. Back in 2016, Buterin approved a hard-forking solution to recover funds stolen from a popular ICO, more commonly known as ‘the DAO‘ within the crypto community. Back then, the Ethereum founder promised the hard-forking was a one-off cop-out. 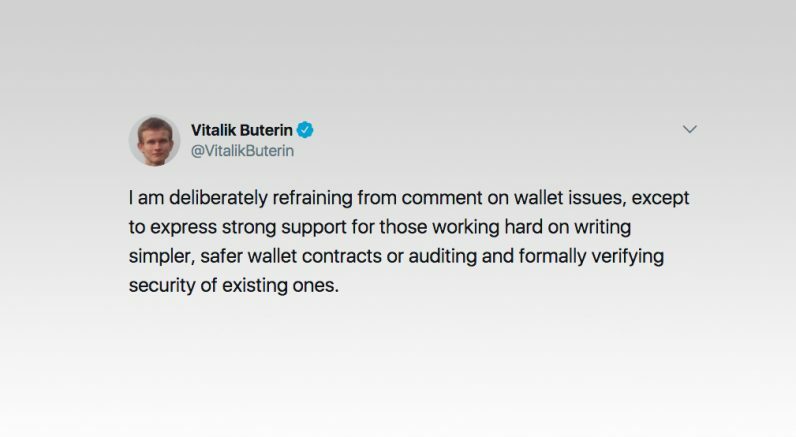 But given how the conversation has spiralled over the past 24 hours, it all but seems that the latest Parity wallet vulnerability will really be putting Buterin’s promise to the test.